More than 20 AAUW members registered for the event. How many of them can you find in this picture? 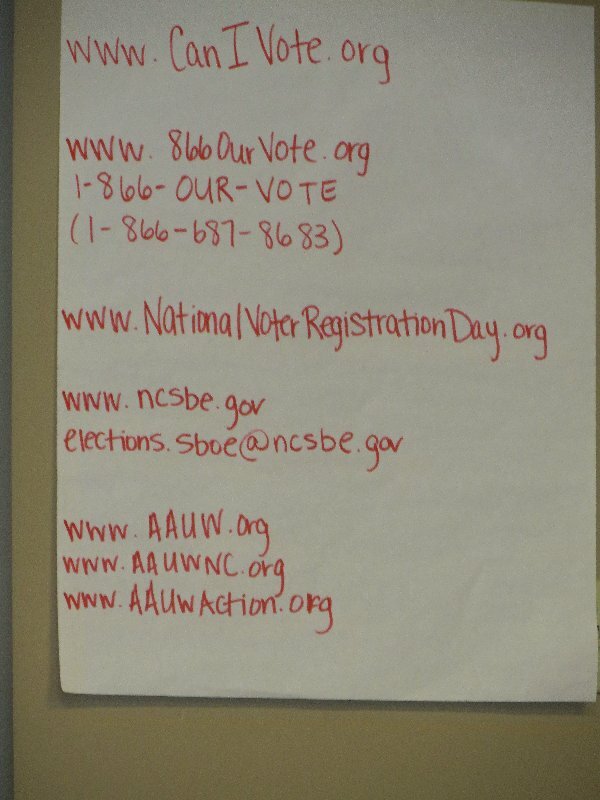 I asked two AAUW members, Denny McGuire who is a “seasoned” NC public policy advocate and Diana Gray, a newcomer to NC and its public policy to review the day for those of you unable to attend. Denny, a recent member of the AAUW NC executive committee, needs no introduction. Diana was the Greater New Orleans public policy chair, so she is not new to AAUW issues and advocacy. She has agreed to be a member of the 2014-15 AAUW NC Public Policy Committee. 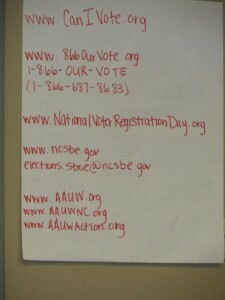 AAUW NC thanks both of them for sharing their summaries. On July 26th, more than 100 women joined together at Bennett College’s Global Center in an educational and inspirational event focusing on the role of women in the economy, culture and political future of North Carolina. The group represented women of different ages, backgrounds, ethnicities and income as well as representing many different non-profits—all involved in women’s issues. In my opinion, the mood of the participants was brighter than the mood at the previous year’s Bennett II conference which came at the middle of the war on women. Content—be funny, you want the message to be re-tweeted so as to reach more people. Competitive—keep your content active and informative so as to keep eyes on you and your cause. Conversation—you want to provoke action, not just watching. While preparing to move to my new state, I was informing myself about some of the actions of this year’s General Assembly in NC to restrict voter rights, limit access to Medicaid under the Affordable Care Act, and to limit women’s access to reproductive choice. I was eager to attend this conference to learn more about North Carolina issues impacting women and to meet those working on these matters. The number in attendance, over 125, representing a wide coalition of justice and women’s organizations, education, labor, professional women, and unaffiliated women amazed me. I was pleased by the diversity of age, race, and backgrounds including those from rural and urban settings. Thanks to lovely friendliness I met about 10% of those in attendance. I appreciated that this was not simply a partisan event. leave, affordable health care, access to higher education for undocumented youth, and the devastation of privatizing of public education. We are truly all in this together. Finally, the Legislative Report Card 2013 handout prepared by North Carolina Women United was edifying. While I was aware of some of the most egregious actions of the North Carolina legislature, I had not know the breadth of their devastating actions this year. Voting booth, here I come along with other enlightened women. Melissa Jackowski, AAUW grassroots advocacy manager, presented a workshop based on AAUW’s voter turnout resources, including the Woman-to-Woman Voter Turnout Guide and information about the AAUW Action Fund’s 2014 GOTV efforts. 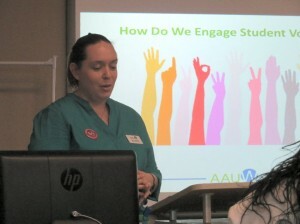 Melissa Jackowski, member of the AAUW national staff, presenting one of the workshops at the Bennett III conference. Resources from Melissa Jackowski’s workshop.